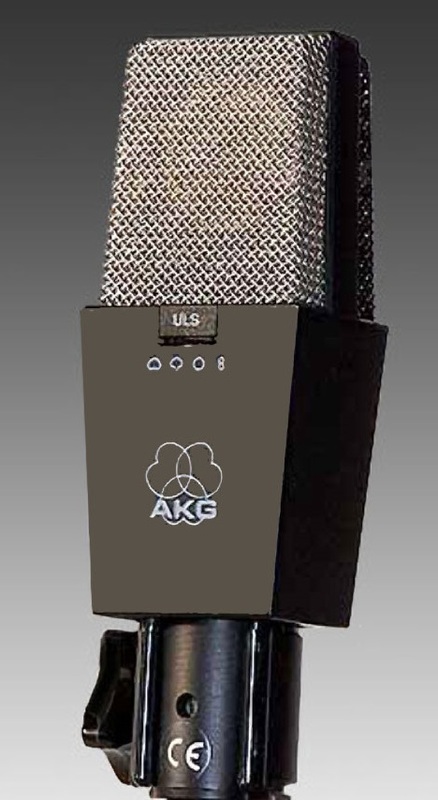 The AKG C414 was available in 2 versions. Either, the C414E, with cannon type connector or, the C414C with a connector to the "Din standard". Identical in appearance to the C412, the C414 continued to use the AKG "Custom" stand mount. Indeed, the C414 and the C412, could both be plugged into the C12A and C12B stand mounts. Fortunately the wiring arrangement is such, that no damage can take place to either the microphones or the power supplies, should the wrong microphone be inadvertently plugged into the wrong stand mount. The C414 proved be a strong competitor to the Neumann U77 and U87. The U77, being Neumann's first semiconductor (FET) version of the U67. *Note: The U77 was one of Neumann's earliest microphones with a "Transformer-less" output stage. Mainly due to the 12volt "T" powering technique used at that time, and therefore the circuit design required by that system of powering. 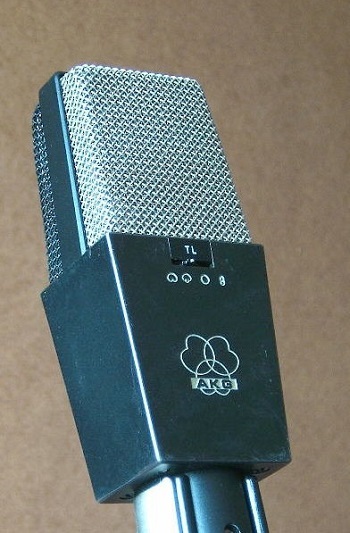 The next version of the AKG C414, was the C414EB. Much the same as the C414, with the addition of a 3 position Attenuator switch (0,-10,-20dB) and 3 position Bass roll-off switch (Flat, 75, 150Hz). One of the major, long term, improvements, was that of the connector type. Since the introduction of the AKG C12A, including the C12B, C412 and C414, a stand mount/connector combination had been used for mounting, and electrical connection, of the microphone. This would prove to be very unreliable throughout it's life, so the introduction of a built-in cannon type connector on the C414EB, was of great benefit to all users. 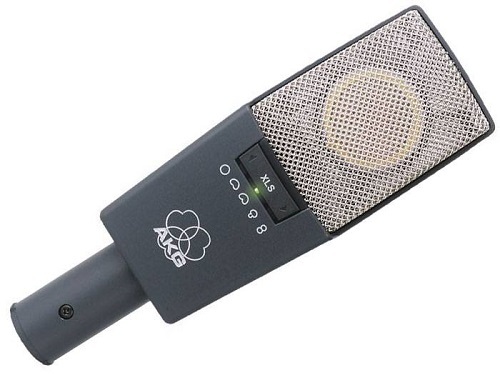 During the production years of the AKG C414EB, manufacture of the "original" CK12 capsule ceased and a modern nylon version (2072-Z-0005) was introduced. This replacement would never live up to the standard of the "Famous" CK12, that had previously made AKG large capsule microphones so wonderful. The tonal qualities of the nylon CK12, are just so different from it's predecessor. 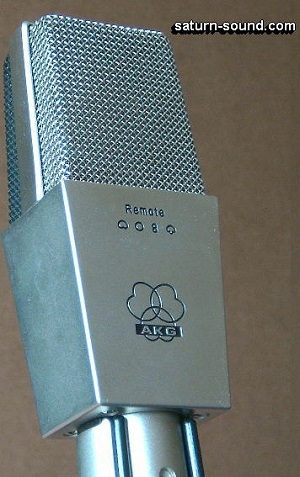 A remote control version of the AKG C414EB was produced. Known as the C414E1. This would be very useful in "Fixed Rig" situations, as the polar patterns were remotely adjustable via the S42E1 remote control box. The S42E1, offered 9 polar patterns and facilities for 2 microphones. The C414E1 looked identical to the C414EB, without the polar pattern switch. The housing used, was that of the C414EB. Hence it still had C414EB stamped on it, with the addition of the word Remote, where the polar pattern switch would have been. The capsule and pre-amplifier, were the same as that used in the C414EB. However, the polarizing voltages, for both sides/faces of the capsule, were derived from a DC/DC converter in the phantom powered S42E1 box. The S42E1, offered 9 polar patterns and facilities for 2 microphones. 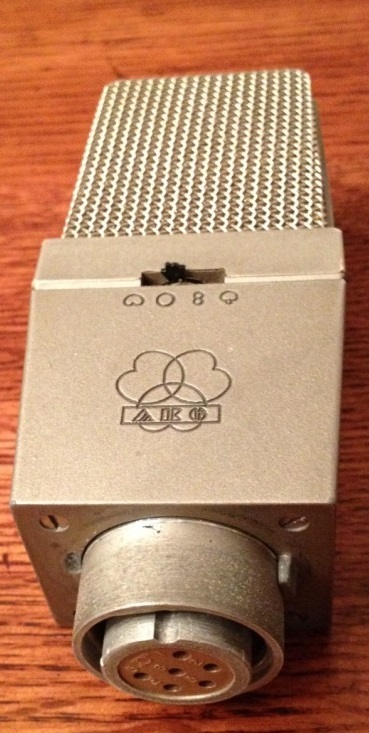 The AKG C414E1 looked identical to the AKG C414EB, without the polar pattern switch. The housing used, was that of the C414EB. Hence it still had C414EB stamped on it, with the addition of the word Remote, where the polar pattern switch would have been. The capsule and pre-amplifier, were the same as that used in the C414EB. However, the polarizing voltages, for both sides/faces of the capsule, were derived from a DC/DC converter in the phantom powered S42E1 box. The "Digital Age" was now upon us, and the need for quieter microphones was very apparent. Enter the C414EB-P48. Until this time, the previous AKG C412 & C414 series of microphones, could be powered from any "Phantom" power supply, offering +12 to +52 volts. However, the C414EB-P48, was designed to work purely on +48v phantom supplies. The polarizing voltage for the capsule, is taken from the +48v supply via very high value resistors and high voltage tantalum reservoir capacitors., rather then the previous way of using a DC/DC converter. The tantalum capacitors were to be a fault liability in the "long term". A new model, the C414B-ULS, was the next microphone to emerge. The suffix ULS, denoting that the microphone had a "completely linear transfer characteristic of all transmission parameters". Looking just like a black/matt version of a C414EB, the C414B-ULS offered better performance figures and reliability, then the C414EB-P48. The electronics took on a highly complex design. Utilising no less then 17 transistors, as opposed to the previous 4 transistors in earlier designs. Whether or not this maze of components could improve the sound quality, would be food for thought. However, we did see the return of the DC/DC converter for polarizing the capsule. Getting the iron out of the audio signal i.e. no coupling transformers, was all the rage at this time. The C414B-TL (Transformer Less) version of the C414B-ULS was introduced. Offering less distortion at high SPL's then the C414B-ULS. Sounding somewhat dryer and more clinical then it's predecessor. AKG were to re-create/emulate the sound of the original CK12 capsule, in a new nylon version (2072-Z-0009), similar to the (2072-Z-0005) already in production. This new capsule was to be used in the "Gold Grill" version of the C414B-TL, to be known as the C414B-TLII. The electronics being identical, in both the TL and TLII microphones i.e. Just a different capsule and cosmetic changes. The only audible difference, between the TL and TLII, being a "Presence" boost. 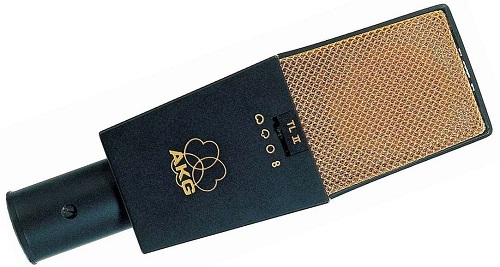 This new capsule would also be featured in the AKG C12VR (Vintage Revival), valve microphone. For those who can remember the AKG "The Tube" (Brown), using the original 2072-Z-0005 nylon type capsule ..... well the C12VR (Green) is exactly the same microphone, with the new 2072-Z-0009 capsule and an additional 3G ohm resistor. The latter wired in parallel with the capsule, front to rear diaphragm, coupling capacitor. *Note - The AKG "The Tube" should not to be confused with the AKG "Solid Tube" valve microphone, which is totally different! So, it is farewell to the old square edged C12A shape we have known for so long (nearly 50 years), along with the associated reliability these older models gained over the years. It is also the demise of the output coupling/matching transformer, that added/subtracted something from the sound obtained. Apparently, it is all about progress ..... Along came the "New Look", rounded edged, C414B-XLS, which will hopefully earn the same positive virtues of earlier designs. Many new features are found on this electronically balanced, "Transformer-less", output design. The capsule being mounted on a internal elastic suspension system, rather then the previous fixed block method. The frame of the microphone, especially where the cage joins the main body, looking somewhat sturdier than that of it's predecessors. All PCB's being held together via their interconnecting plug/socket system. Logic circuitry is used for switching of all parameters. With LED display of chosen settings and overload. All switch settings are "Lockable" to avoid accidental changes, or tampering, of the selected settings. A useful addition, is the provision of a 5th polar pattern i.e. Soft Cardioid. Therefore, I wonder why the microphone was not called the C415B, following the tradition of the last digit being the amount of fixed polar patterns available. Who knows? The C414B-XLII is cosmetically and electrically identical to the C414B-XLS, other than the "Gold Grill" and gold print on the microphone together with a different capsule. The capsule used in the C414B-XLII offers the same advantages as that of the capsule used in the C414B-TLII. A "Useful" audible difference, between the XLS and XLII, being a slight "Presence" boost above 3KHz on the later model. The latest range of C414 microphones are, cosmetically and electrically, much like the C414B-XLS and XLII above. They both offer no less than nine (9) switchable polar patterns i.e. the addition of the four intermediate patterns between the five found on the previous C414B models, together with a few other improvements over their predecessors. Foundational text courtesy of Saturn Sound Recording Services. 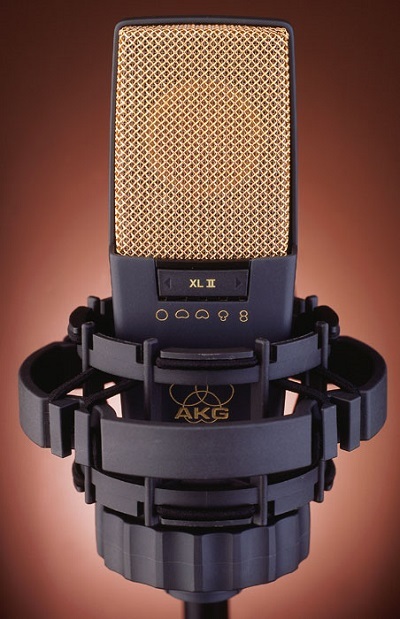 Do you have content, to add, about the AKG C414 series of Microphones or associated topics? Please feel free to Share it, here!